Comparing and Contrasting - Halloween Style! I got home Friday, sat down in front of the computer (fiancé was working late - I swear we're not 100 years old every Friday night LOL), and had a minor heart attack. I had left my flash drives IN the computer IN my classroom...a good 42 miles away from me! Now, I knew they were safe and sound, but that meant I couldn't catch up on all the blogging that I missed last week! To make up for the blogs you would've/should've gotten to read this weekend - I'm giving this activity packet away for freeeeeeee until Wednesday 10/23/13! Cue victory lap! ANYWHO, many of you may have seen this picture (see left) on instagram (@practicallyspeeching) and wondered, "I want candy corn! I want m&ms! I want this activity! Where is it!?". Welp, you're in luck! It's now on TpT for your downloading pleasure! Link HERE. Oh, and if you weren't wondering that - it's still free and on TpT for you! This one is a LOT of fun. If you can do food in your Speech room, I suggest using the real stuff! 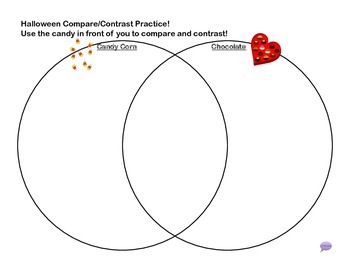 Students compare/contrast the candy corn in front of them. Writing it large on the board, and having them transcribe on their own graphs works best - I think at least! For the little ones who aren't writing, I had them draw their descriptions and tell me verbally. You can send a rocking take home assignment to decorate each candy and tell the differences also! Turn this into a full writing task where students pull information from their graphs and use it to describe using these great, lined candy corns! I used all of my venn diagrams and candy corns for "the great candy corn debate" as a bulletin board in my room! There is a ton more take home assignments and comparing/contrasting activities - ghosts and witches! Chocolate and candy corn! Winter and Summer! Download this for FREE until 10/23 HERE! !